1. Massed Russian T34/85s move at speed toward Tucheban. 2. WW explains the rules to new players. 3. One T34 of each company mounting smoke candles tries to screen the flanks of the unit. First Blood - Russian take casualties as Germans get the range. 4. The massed Russians have run hard into the teeth of the waiting Panthers. Casualties start to mount on both sides. 5. Germans have stopped the three companies to the front of Tucheban, but the cost has been high. 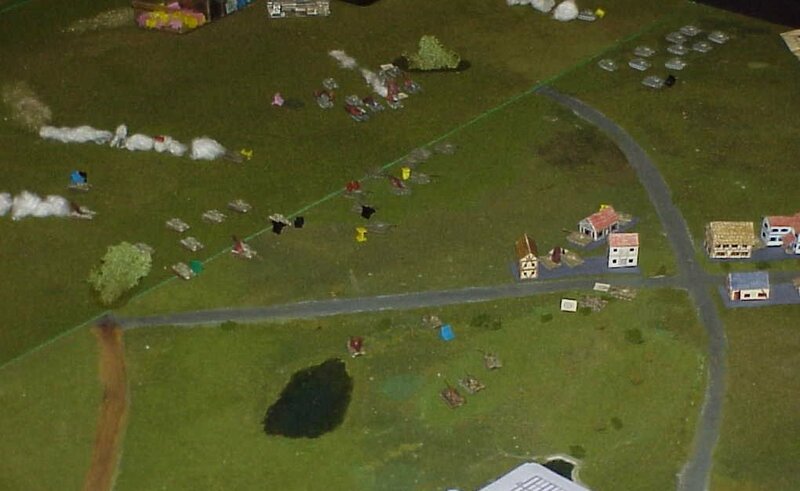 A fourth company has moved unscathed into the town from the south. The morale of the Panthers north of the town now cracks and crews abandon all damaged vehicles. The Panthers in town are confused. They first retreat then have second thoughts and try to return to town to fight only to find the T34s waiting for them there. just try to stop them from getting into the town. The Soviets had 52 T34/85's to use in their attack. 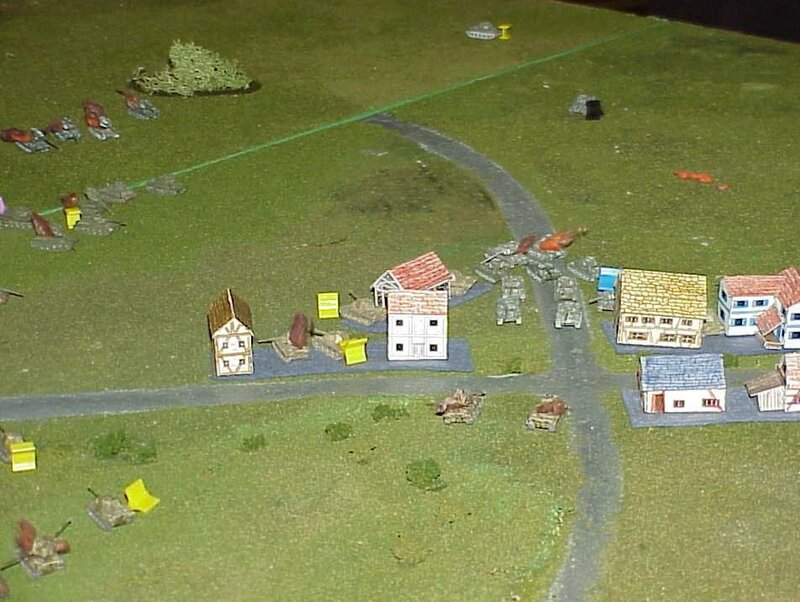 The German players put two platoons in and around Tucheband (which was on the German right), along with the 2-tank HQ. 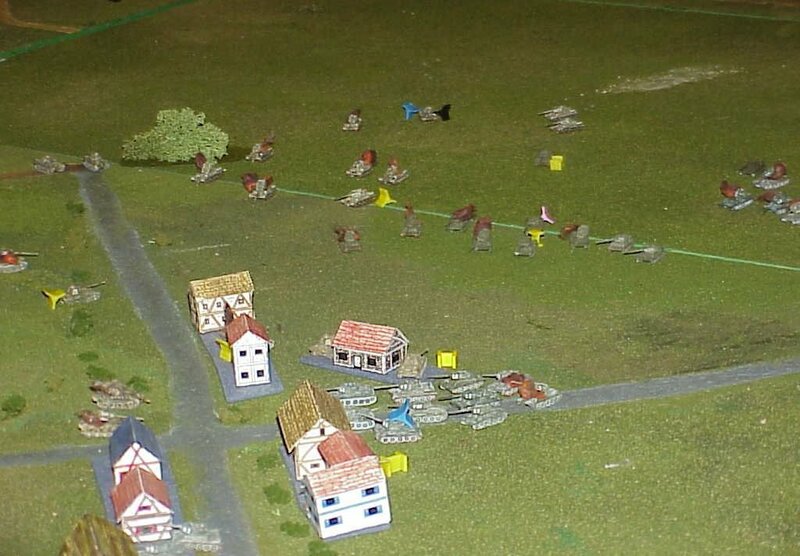 The other two platoons held the left side of the line in hull down positions. 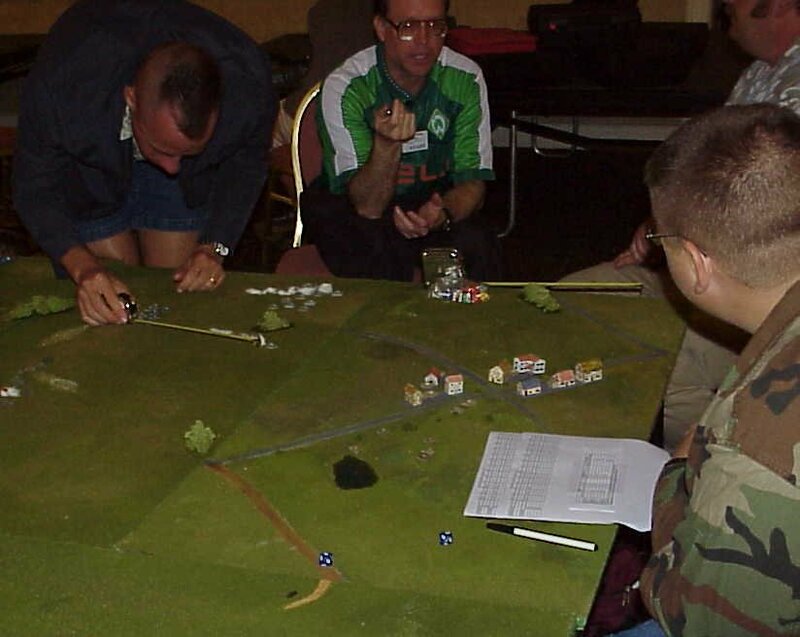 The terrain was very open and was basically flat, though not as flat as the real battlefield, which was pancake-like. The Soviets rolled the "Get 3 undamaged tanks into the village" mission, which was the easiest of the 3 possible missions. They ran a company of ten T34's at the right of the German line, pinning the German left then directed the remaining two battalions at the at the village. On the German left, one platoon of Panthers knocked back the company of T34's, but suffered three losses and a morale failure. 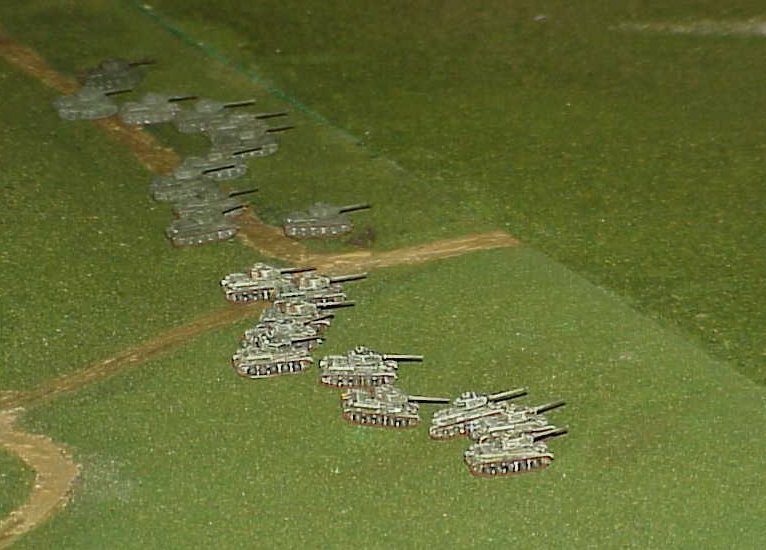 The second Panther platoon on the German left could now be released to reinforce the hard-pressed Germans in Tucheband. was not enough. The HQ suffered a command brain-clog and was lost without KO'ing any T34's. There were 15 T34's in the village and only 5 Panthers on the outside, looking in. The battle was over. I made two 2' x 2' boards for my nephew to use with his Warhammer game. 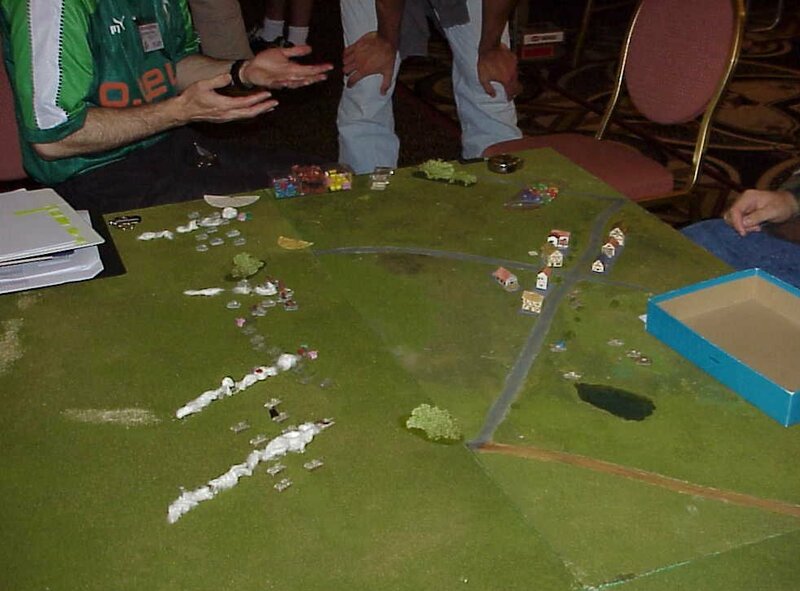 They use HO model railroad trees. 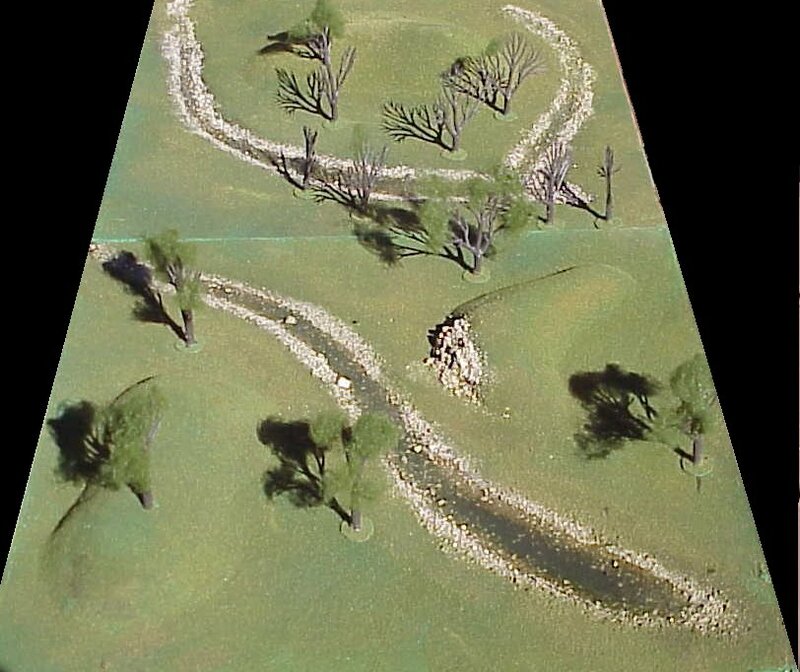 I also used real sand and gravel from a stream bed to line the boards little river.